Do you want hot water on demand and not waste water that is not being used? Have you ever gone to a home show and was fascinated by all the hot water heaters in the convention room? Then your eyes saw it two rows over, as if it needed no introduction and there were not that many people around it.. it was a tankless water heater. What is the benefit to having a tankless water heater versus a regular water heater? Want to talk with the experts about a tankless water heater? When you call Knoxville Plumbing, you may be surprised to learn you get Knoxville’s tankless water heater experts. This company has installed over 100 tankless water heaters. You get our expertise and first rate service that can’t be beat. Tankless water heaters are cost efficient in that it only heats the water as needed. If your home is small and doesn’t have a lot of space, going tankless can give you some additional space. We know you are excited about the possibilities of going tankless. First before you do that it is crucial you speak with knowledgeable plumbers that have experience in installing over 100 tankless water heaters. Who else can provide you with that information? Needless to say, Knoxville Plumbing has probably seen every type of scenario when it comes to size and type of tankless water heaters. Main benefits of a tankless water system are as follows it can help you save on utility bills; get endless hot water, best warranties in the industry, on time service with 24 hour service and you can also receive interest free financing. Another huge benefit to the tankless water heater is that you can take a shower, wash dishes and even run the washer all at the same time and not worry about running out of hot water. Hold on don’t run to the phone just yet because that is a strong selling point for you. Knoxville Plumbing gives its customers our total commitment to ensuring they are satisfied. You can also read testimonials from other happy customers on our page. Choose our family-run business because we care. We can help you choose the right tankless heater for your home in addition to scheduling the installation. 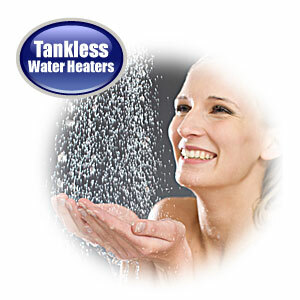 Tankless water heaters is one of our specialties and we look forward to serving you. Get ready to use the heater that caught your attention at the home show.